Local food is one of the most important aspects when I travel, so when we found a food tour on the website withlocals.com, we were sold! We agreed to meet with Buddhima, or B for short, by Majestic Plaza on Galle Road, that ended up being the street of the evening. B is one of many locals who offer unique experiences on the newly established website. First stop of the tour was Pilawoos. Let’s make it a statement right away; the Sri Lankans sure like their drinks sweet! B wanted us to try a popular drink, iced Milo chocolate milk, with sweet condensed milk added. Apparently it is a good thing to drink to avoid hangover. A great combination, as this is one of the most popular places to eat after a late night out. B ordered one chicken and cheese kottu and one string hopper biriyani. The first has to contain rotty, but the vegetables mixed with it can vary a lot. The latter has a string hopper base, also mixed with different vegetables. Both are chopped in small pieces. 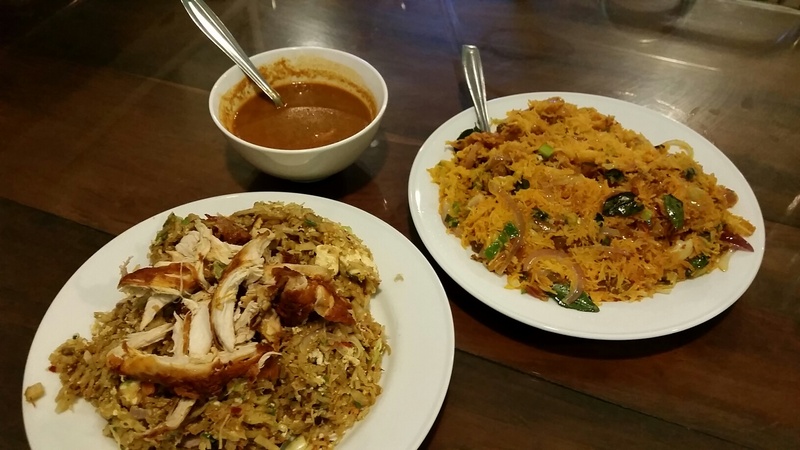 Chicken and cheese kottu and string hopper biriyani at Pilawoos. We could hear the continuously loud chopping from the kitchen in the background. It might sound like an annoying background noise but if you are lucky enough to have one of the older traditional chefs preparing the food, they might chop in a musical rhythm. As a refreshing a cleansing drink after a spicy meal, lime juice is absolutely recommendable. Next stop, Hotel Plaza. The name might give you associations to western style hotel, but don’t be afraid, it’s far from. Here we were served plain string hoppers with dhal curry and chicken curry. The food was good, but it didn’t excite the taste buds as much as the last two dishes. Our table had view to the kitchen, giving us great insight to the food preparations. 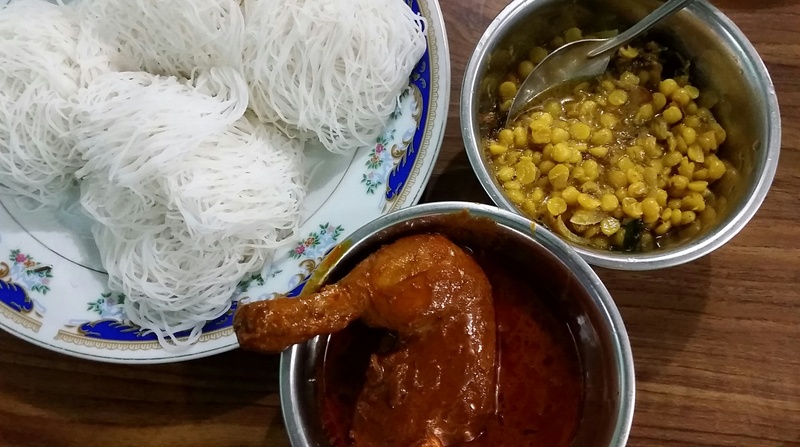 Plain string hoppers with dhal curry and chicken curry. Another trick to alleviate the strong flavors is to drink something warm. We tried one plain milk tea and one flavored with ginger. Next in line was to try the hoppers and hoppers with egg. Not to be confused with the string hoppers, but looks more like a bowl made of thin dough. It was served with two kinds of seasoning on the side, both based on onion, but still completely different tastes. The place also recycle; the newly washed plates were still wet and the water was poured in the bowl on the table to wash hands. In addition they used pieces of newspapers as napkins. To show that the spoons were disinfected, they were put in a glass of boiled water on the table. The small details count. Finishing off, we actually ended up right next to our guesthouse for ice cream desert at Carnival. As always we wanted to try new tastes, and went for one scoop of mandarin and one mango. Not that the tasted were not familiar, but as ice cream they were new. And as we guessed after todays experienced, they off course were sweet. 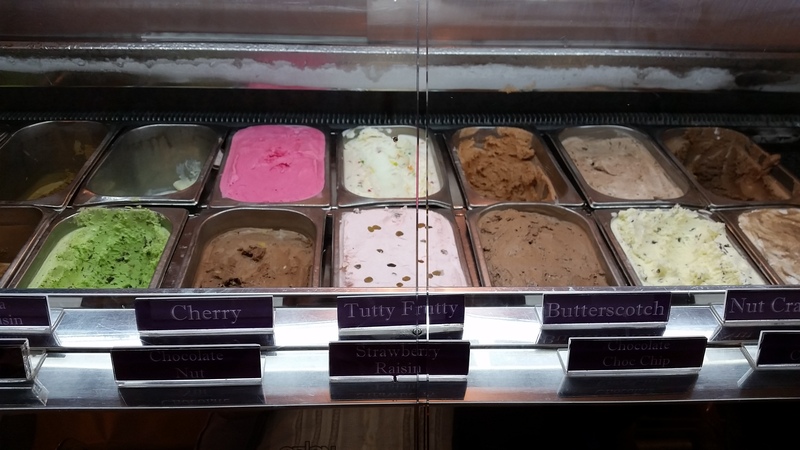 Pick you flavor at Carnival ice cream. 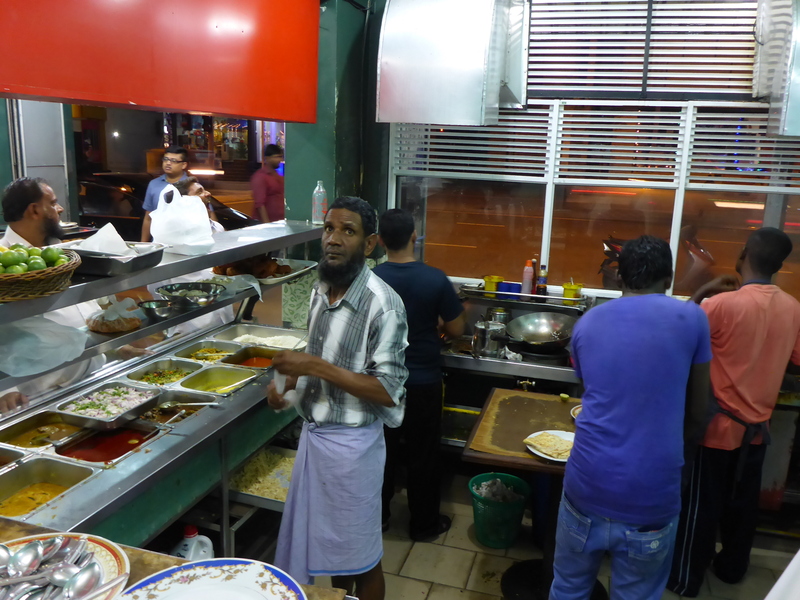 The tour with B certainly showed many aspects of the Srilankan way of life, both through the food and the culture as he described it. Definitely a recommended experience! 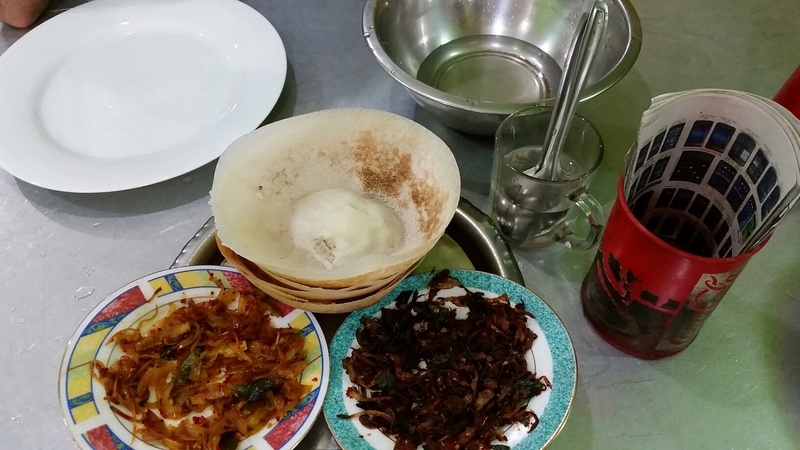 Pingback: Local bars in Colombo | Life is a journey!